Food is integral to life. It meets basic human needs for growth, development and function. It is also important for the functioning of societies, allowing people to make social linkages and distinctions. It plays a role in multiple aspects of life and is a subject of interest and inquiry in multiple disciplines including agriculture, anthropology, geography, humanities, law, nutrition, psychology, public health, public policy, and other natural and social sciences. With food security and environmental sustainability becoming increasing global concerns, there is an urgency to educate the next generation of leaders with strong interdisciplinary foundations. The Food Studies graduate certificate program offers UCLA PhD, MA and professional school students the opportunity to investigate this growing field. The program will prepare students from diverse disciplines to address complex topics that span food cultures and histories, nutrition and public health, food policy and food justice, urban planning, and agrifood systems and the environment. Successful completion of the certificate requires four graduate courses (16 units). Students must complete the Food Studies core course, URBN PL 216 (4 units), and three additional courses (4 units each) selected from at least two of the three subject areas below. Health promotion strategies aimed at reducing chronic disease risk through lifestyle changes have not been particularly successful in addressing needs of socioeconomically disadvantaged groups. Overview of literature supporting relationship between socioeconomic disadvantage and food-related health conditions such as obesity, diabetes, and osteoporosis. Critical examination of plausible pathways from perspectives of multidisciplines (economics, nutrition, sociology, and more), with focus on linkages between social and physical environment (including built environment) and food equity/access; discussion of how food may be catalyst for improving social capital and health. Discussion of examples of local and international efforts to improve access to healthy foods and/or limit access to unhealthy foods. Exploration of methods for assessing social capital and food-related aspects of neighborhood environments. S/U or letter grading. What factors determine health, illness, and disease in global context, including political ecology of infectious diseases, child health issues, women’s health and reproductive health, global trade in legal and illegal drugs, demography and health transition, structural adjustment, problems associated with globalization of pharmaceutical industry; antibiotic resistance, and globalization and health equity. Letter grading. Nutrition of mothers, infants, and children in countries at various levels of socioeconomic development; measures for prevention and treatment of protein/calorie malnutrition; relationship between nutrition and mental development; impact of ecological, socioeconomic, and cultural factors on nutrition, nutrition education, and service. Letter grading. Review of all aspects of contemporary nutrition sciences that require application of epidemiologic principles and methods, ranging from food-borne outbreak investigation to evidence-based regulatory assessment of health claims for foods. Experience in actual world of collecting, analyzing, and interpreting data related to nutrition and health or disease outcomes. S/U or letter grading. Studies in interrelationships of literature, arts, and sciences; limits of investigation set by individual instructor. May be repeated for credit. S/U or letter grading. This class reviews the array of food and production systems, systems of distribution and systems of consumption to address what are among the most widespread human impacts on planetary biodiversity, landscapes, climates and social systems. Everyone eats, food is as full as meaning as calories, so the questions of how these food production systems unfold, why they unfold the way they do and the array of alternatives of many kinds require more in terms of analytics than food and identity, the existence of food deserts or the realities of exploitation in Arkansas chicken abattoirs. These are of course part of the story, but hardly capture the longer term questions. Food systems are also the gateway into understanding our current environmental dynamics, which cannot be solved without addressing Ag. Further, the domains of urban planning increasingly have to take urban production systems of many kinds into account, and we are not just talking about farmer’s markets here. While providing a general overview, the class requires research teams to analyze and assess some of the impacts and debates of particular topic weeks. The class is more about the debates and politics than normative directives (“Eat organic”), but there is a great deal of policy that comes out of the discussion. There is a lot of reading. This class looks at the questions in terms of larger systems, local consequences and environmental implications. We start from the wild and least known, to the realm we think we know, that is, the city as production arenas for producing domesticated and wild stuff. Health issues throughout Americas, especially indigenous/Mestizo Latin American populations. Holistic approach covering politics, economics, history, geography, human rights, maternal/child health, culture. Letter grading. UCLA School of Law has recently established the Resnick Program for Food Law and Policy. This new program recognizes the important role of food law and policy in a modern food system that is different than anything the world has ever experienced. This modern food system – from the farm to the fork – has given rise to profound health, environmental, social, and cultural consequences. This Introductory course will show how food law as a response to this modern food system has adapted and developed into a distinctive area of law via five distinctive phases. From genetically modified food to labels to obesity, this course will cover a number of issues important to all eaters. The course will focus on one issue in particular – sugar – and examine its place in the history of food and food trade and attempts to regulate this sweetener. The course will explore the legal implications of recent sugar-addiction studies. Assessment of nutritional status of families in developing countries, with special reference to limited resources, terrain, and cross-cultural considerations, stressing anthropometric methods and techniques. S/U or letter grading. Lecture, two hours; discussion, two hours; field visits. Preparation: one nutrition sciences course and/or nutrition program experience. Nutrition programs and policies in U.S. and developing countries compared and contrasted. Analysis of role of major international, governmental, and nongovernmental agencies. Emphasis on meeting needs of vulnerable populations. Letter grading. UCLA School of Law has recently established the Resnick Program for Food Law and Policy. This new program, the first of its kind at a top tier law school, recognizes the important role of food law and policy in a modern food system that is different than anything the world has ever experienced. This modern food system – from the farm to the fork – has given rise to profound health, environmental, social, and cultural consequences. Bundling these consequences into a series of legal and policy issues, this course will facilitate discussion on a host of topics: food safety, obesity, nutrition, sustainability, food deserts, labeling, marketing, trade, biotechnology, organic, private standards, urban agriculture, hunger, right-to-food, animal welfare, local food programs, and farmers’ markets. Readings of cases, legislation, regulations, and provocative writings will both frame and stimulate class discussion. This course will also review the development of food law and assess its role in responding to the issues covered in the course. At the same time, individual papers and projects will permit in-depth exploration of a topic of interest. Such papers may satisfy the law school’s SAW requirement. Cities are increasingly recognizing food policy as an important subject to be addressed at the local level. This has been demonstrated in the incorporation of food into municipal planning and policy documents, such as Seattle’s Food Action Plan, New York City’s sustainability plan (PlaNYC), and the Plan for a Healthy LA for the city’s General Plan. In addition, cities are implementing programs and policies to address the challenges faced by urban communities: disparities in healthy food access, diet related disease, food insecurity, and sustainability planning. Behind all of these policies and programs is the policy making process. This class will engage students in learning about legislative and policy advocacy through the lens of municipal food policy case studies. Materials will include municipal plan documents, local laws, and legal and news articles. Recent or currently active policy issues will provide the subject matter for the course. Students will be assigned to play different roles in the policy making process through mock advocacy exercises, such as city council hearings, lobbying meetings, or stakeholder briefings. Students will produce materials in varied writing formats such as presentations, op-eds, press releases, and/or legislative testimony. 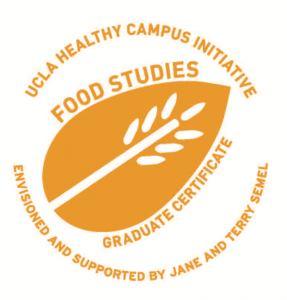 Thank you for your participation in the UCLA Food Studies Graduate Certificate Program! Please complete the form below as the final step for earning your Food Studies certificate. Every field is required. If your petition to graduate is approved, you will earn your certificate at the Food Studies dinner in May. The deadline to submit the 2018 Intent to Complete & Exit Survey has passed. If you would like to be considered for completion in 2019 please complete the form below and send it to Alexis Oberlander (food@luskin.ucla.edu) by the May 2019. Students must obtain at least a B in all courses that will be used to satisfy the certificate requirements. All graduate (masters, doctoral, professional degree) students currently enrolled at UCLA with a cumulative GPA of at least 3.5 are eligible to apply for participation in this certificate program. Admission is based on academic performance and a statement of interest in food issues and interdisciplinary learning approaches. On average, about 10 students will be admitted to the program each year. The 2019 application is now available! Deadline extended to March 4th! Email your supplemental materials (CV/Resume and current unofficial transcript) to food@luskin.ucla.edu with the Subject line: Application – Your Name. Students will be notified about their admission status by March 15th. If you have additional questions, we are happy to help! Please contact the Certificate Project Manager, Danielle Maris Lacob, at food@luskin.ucla.edu or 310-825-7331. May I apply courses that were taken before being admitted to the certificate program? Yes. Any course, on the approved list, that is taken before admission to the certificate program may be counted towards the certificate. May I use a course that is not on the approved list? Possibly. You may petition to use a course that is not on the approved list. To submit a petition send the course syllabus to food@luskin.ucla.edu. Will I be able to use the certificate courses towards my degree requirements? Generally yes. According to University policy, courses used towards a certificate program may also be applied to degree requirements. Department policy may vary so please check with your departmental staff or faculty adviser. Are certificate students required to take 4 classes or 16 units? Students are required to take a minimum of 16 units worth of coursework to earn the certificate. Can I take the core class or electives pass/no pass? Students enrolled in the certificate program must take the core and elective classes for a letter grade (unless the class is only offered pass/no pass) and receive a B or better. Check out the Food Studies Event Calendar for information on events and activities on campus! Health Campus Initiative Student Grants – applications available weeks 2 -6 on a rolling basis. Join the Food Studies listserv to receive updates on classes, events, applications, job/volunteer opportunities, and more!